Sharadiya Desh 2016 (1423) digital book pdf. 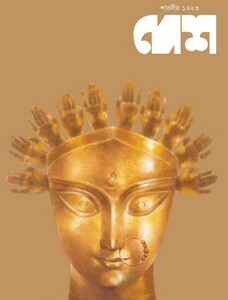 Desh is a only literary magazine of Bengali language by Anandabazar patrika from Kolkata. Mainly it is a fortnightly edition but every year before the Durga Pujo festival, it publish on a special issue called Puja edition. Now I'll share with you Sharadiya Desh 2016 (1423) edition. All novels are written by various prominent authors as Shirshendu Mukhopadhyay, Smaranajit Chakraborty, Sukanta Ganguly, Sourav Mukherjee, Prochet Gupta. Stories are written by Samaresh Majumdar, Harsh Dutta, Tilottama Majumdar, Krishnendu Mukherjee, Sangeeta Bandyopadhyay, Bipul Das and Chandasi Banerjee. Special attraction of the issue is Satyajit Ray's letters. Multicolored painted by Ramkinkar. Friends no you can get a pdf file of the special edition from link below. Hi Anirban.. thanks for uploading these Bengali magazines.. This is really helpful specially those are not staying in WB. You r doing a great job! !.